Fresher from Fr.Meachair promotion IT Carlow have reached the Purcell semi-final against all odds to be pitted against 2015 Division 1 league finalists Maynooth. These sides last met in October 2014 for Purcell relegation/promotion with the University easily defeating the IT. Although these sides haven’t met in the 2016 championship, the Purcell Cup has been too close to call and this game will be no exception. Following their successful championship campaign, IT Carlow defeated St. Pat’s in IT Carlow in round one and drew with 2015 finalists DIT on Monday night to top the group. 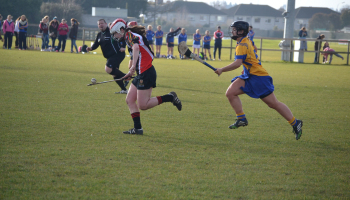 In group B Maynooth took on CIT in Maynooth held on for a single point victory. To add to the drama, Queen’s pulled a win over Maynooth bring group B down to score difference. As a result CIT finished on top with Maynooth finishing second. Both sides prove extremely strong up the centre with the pair of Carlow’s Kate Nolan and Kilkenny’s Sarah Ann Quilian Maynooth’s main women. Wearing black and red, IT Carlow’s spine of Kilkenny’s Edwina Keane, Offaly’s Siobhan Flannery and Cork’s Finola Neville will be a handful to manage. Throwing in at 3pm the Purcell Cup semi-finals is set to be one to watch as it is too close to call who will book their All-Ireland final spot the following day. This entry was posted in News and tagged CCAO, Maynooth itc by CCAO PRO. Bookmark the permalink.